After 1.5 years of collection events, culturing, identification, and selection of candidates our space microbes experiment finally is in orbit. Our 48 microbes, collected from a variety of built environments on earth, are now whipping around the planet. 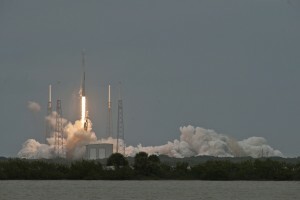 The rocket took off from Kennedy Space Center at Cape Canaveral at 3:25pm EST yesterday. In a couple of days they’ll dock with the International Space Station (ISS) and start growing. Equally exciting is the fact that in our “cube” are 15 swab kits for the astronauts to take samples from around the ISS. In collaboration with Jack Gilbert and the Earth Microbiome Project, we will analyze these swabs for 16S, 18S, and ITS… hopefully giving us a complete picture of the (non-viral, sorry Scott Kelly) microbes present on the ISS. Really excited to get both the growth data from the “microbial playoffs in space” as well as start working on the swabs.